With an approachable staff, even late at night, this eclectic coffeehouse brings in live music and entertainment. Check out their e-coupons on their website. Cute little coffee/sandwich house that's open late! Very friendly staff and the food was delicious. Props to Panda who who took care of us that early a.m.. Essential for late night and early morning. While working in Nashville, a friend of mine came to visit from Chicago. He was on his way back from New Orleans and Thanksgiving with family down there, back to Chicago. He had very little time to visit, since he was on his way back to work the next day. I put him up in the hotel I was at, and let him rest until about 10pm. Where to go for food coffee, bagels and stuff you can eat while on the road? Well, we drive from Franklin to Nashville, it takes us a while to find this place, even with the Judy Garland(aka Garmin), but we arrive. We thought it might be closed. Thank the God of our own choice it was NOT. Not only was it open, it had a nice crowd. So from 11:45 to 1:30am, we were able to grab grub, inject enough coffee into him to drive all the way to Chicago so he could do a half day's work. Gay friendly, Jew friendly, nice people who like to talk to others and have a good conversation. The food wasn't perfect, but it was good, especially open at midnight. Their attempt at "French-Canadian fries" was somewhat off. They needed to use curd cheese and the dish is called "poutine" and it's Québécois as opposed to "French-Canadian" but nevertheless that, plus humus, plus chicken fingers fed two people. Of course my friend, being the good Joo that he is, couldn't go without a tuna melt sandwich and a veggie burger bagel for the road. I have only eaten here once...not exactly a congenial crowd for me...maybe due to my age. But still the food is good. Might try it again. Cafe Coco is awesome! It's conveniently located near Vanderbilt University in West End. What's awesome about Cafe Coco is that it's a LOCAL restaurant, not a Starbucks or another franchise (nothing wrong with those, it's just refreshing to find a local business that does it so well!). Whether you're going just to have a great latte or to have a full breakfast or lunch style meal, Cafe Coco is the perfect place to go, 24 hours a day! Definitely gay friendly, and in a great part of town to see and be seen. Only a couple of minutes from Centennial park, you could even get your meal to go and then go hang at this very popular park. The menu ranges from breakfast bagels, sandwiches, and traditional specials, and the lunch menu ranges from sandwiches and burgers to pasta and pizza as well as great Wraps and Salads. Check out their music nights. What??? 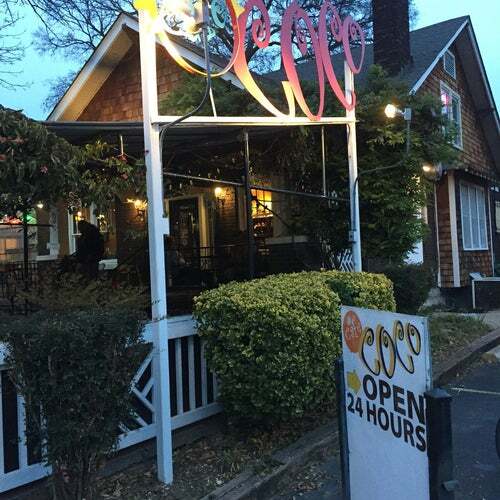 Yes, you know Nashville is known as Music City, and Cafe Coco carries out that tradition by offering live music events. Definitely a place to check out!